When Mike Stavlund's four-month-old son suddenly died, a flood of cards, flowers, meals, phone calls, and gifts let his family know that they were loved and cared for. What was less welcome were the books, and particularly the religious ones. Often impossibly upbeat, saccharine sweet, and with all kinds of confident promises, they increased the pain rather than soothing it. Though Mike could plainly see that these writers meant well, their preoccupation with defending pristine ideas about God from the suddenly obvious truth of God's unkindness created a cognitive dissonance of such scale that he simply put them away. They were too painful to read and too offensive to bear. Instead he wrote his own book, one week at a time during that first terrible year. 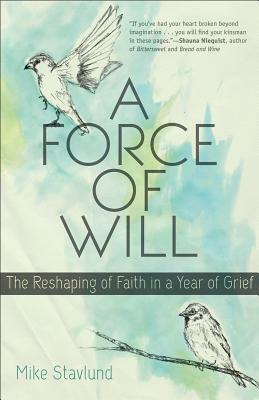 A book that embraced the stark reality of loss, the sense of alienation from all of life, the feelings of suffocation at the hands of the well-meaning people gathered around, and the new awareness of feeling abandoned by God. "A Force of Will" helps anyone who is going through difficulty to honestly confront their feelings without being made to feel guilty. With heartfelt honesty, Mike shows that there is hope--even when there is no happy ending. Mike Stavlund (MDiv, Trinity Evangelical Divinity School) leads Common Table church in the Washington, DC Metro area, which has been featured in such publications as "US News and World Report," "The Washington Post," and "Voice of America." An adjunct faculty member at Wesley Theological Seminary in Washington, DC, Stavlund is a regular writer for Emergent Village at Patheos.com and at TheHardestQuestion.org, and is a frequent speaker at Christian conferences. His writing has been influenced by his family's experience of infertility, threatened pregnancy, infant cardiac surgery and critical care, grueling round-the-clock home care, and the sudden and shocking death of his son.